Instead of the usual beep sound, the cheery voice of a child saying “Thank you po!” is what you will hear when you tap your beep™ card in any of the Bantay Bata kiosks located in LRT1 stations. In lieu of the cans and personnel manning them, special beep™ card donation terminals called Bantay Bata kiosks have been deployed at LRT 1 stations at Roosevelt, Balintawak, D. Jose, Central Station, Gil Puyat, and EDSA Taft, Monumento and Baclaran. Each tap donates five pesos (P5) to Bantay Bata. Donations are deposited by AF Payments Inc, operator of the beep system, to the foundation’s bank account on a daily basis by electronic means. “We are pleased to make our technology available to Bantay Bata 163 to make the act of donating and collecting donations more convenient for all. 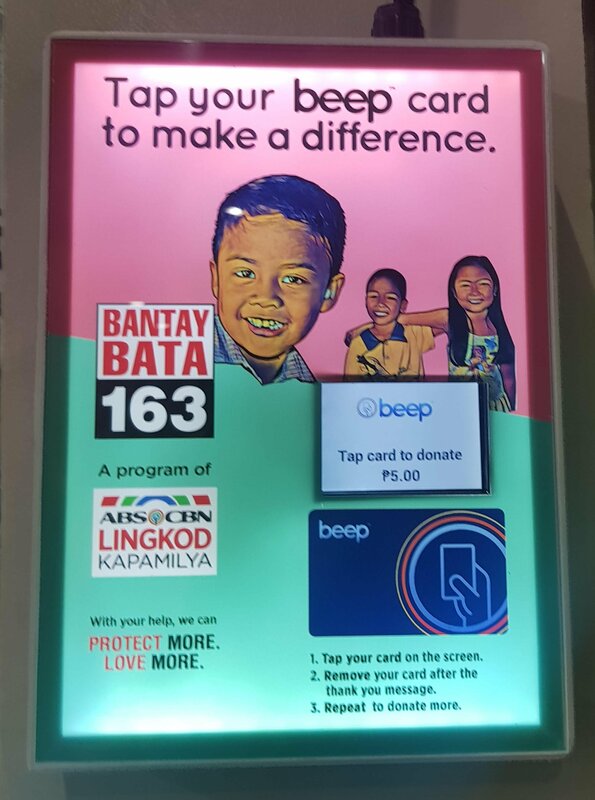 A simple tap with your beep™ card at the Bantay Bata kiosk allows you to share your blessings with the kids of the foundation. Our technology is beneficial not only to commercial entities but to charitable organizations as well,” said Peter Maher, president and CEO of AF Payments Inc.
Bantay Bata 163 is the child welfare arm of the Lingkod Kapamilya Foundation. It gives hope to abused Filipino children and their families through the support and generosity of individuals and organizations around the world. The Bantay Bata kiosks save the foundation operational costs in terms of the deployment of cans, collection, counting, bank deposit, and the like, thereby allowing it to reallocate manpower to where it’s needed more. This program is done in partnership with Light Rail Manila Corporation, the operator of LRT1. The beep™ card is a reloadable payment card used in all three elevated railways (LRT-1, LRT-2, and MRT-3) and select buses, PUVs, tollways, and retail partners. It is reloadable and valid for four years. AFPI continues to grow its loading network, and has recently installed beep™ e-loading stations in all LRT-1 stations for those who would like to load their beep™ cards directly from their debit accounts or e-wallets. It is also increasing the deployment of beep™ loading kiosks, which provide cardholders the convenience of unmanned 24/7 loading service. The company has recently expanded beep™ acceptance to the Visayas region through the Topline Marina ferries that travel between Cebu City and Mactan. It is also partnering with transport cooperatives that are participating in the government’s public utility vehicle modernization program. More information about beep™ is available at its website and official social media pages on Facebook, Twitter, and Instagram.